While it is not the most common of the skin cancers, melanoma causes the most deaths proportionately, and should be a serious consideration for Caucasians, especially northern and north-western Europeans, living in sunny climates. 17.03.2015 - The highest rates are found in Europe, North America, Australasia, Southern Africa, and Latin America, with melanoma causing 75 per cent of all skin cancer related deaths globally. Melanomas are cancerous growths that develop when damaged skin cells trigger defects and mutations which lead to the cells rapidly multiplying and forming malignant tumours. These originate in the pigment producing melanocytes, which are found in the basal layer of the epidermis, and the most common cause is intense UV exposure; frequent sunburn and use of UV radiation emitting sunbeds. Melanocytes produce the dark pigment, melanin, which is responsible for the colour of your skin. These cells are also found in other parts of the body, including the bowel and the eye so, though on the skin is the commonest, melanoma can actually occur anywhere that contains melanocytes. Skin melanomas usually resemble moles, with some developing from them. Mostly they are brown or black, but can sometimes be skin-coloured, pink, red, blue or even white. The good news, however, is that they are almost always curable if recognised and treated early: otherwise, the cancer can spread to other parts of the body and become much harder to treat. Moles, brown spots and growths on the skin are usually harmless but if you’re unsure it’s always best to seek medical advice. People with more than 100 moles on the body are at greater risk so it’s very important to know your skin well and identify any changes to growths. Look for the ABCDE signs of melanoma, and if you see one or more make an appointment for a check-up: Asymmetry, Borders (irregular), Colour (flecked and multi-coloured), Diameter (greater than 6mm), Evolving (over time). This does not always apply to the most dangerous form of melanoma, nodular melanoma, which has its own classification: (EFG) Elevated above the skin surface, Firm to the touch, Growing. Early symptoms of melanoma include changes to shape or colour and, in the case of nodular melanoma, the appearance of a new lump. At later stages the mole may itch, ulcerate or bleed, and advanced cases can include loss of appetite, nausea, vomiting and fatigue. In women melanomas are most commonly found on the legs, and with men it’s the back. Surgical removal of the tumour is the best treatment if found early enough and while it is still small and shallow. If it can be completely removed the chance of curing the cancer is high. Survival rates in the US, for example, average 91 per cent. However, the probability that it may return depends on how deeply it has penetrated the skin layers. For melanomas that come back or spread, treatments include chemotherapy, immunotherapy or radiotherapy. 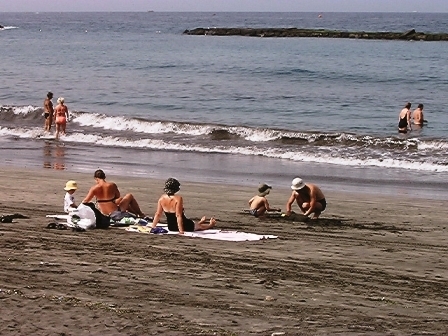 The Canarian government’s health department recorded a diagnosis of 2,568 cases of melanoma and other malignant neoplasm conditions in the Canaries during 2013; of that number 2,378 were new patients. Exactly 227 people were diagnosed with malignant melanomas and 2,341 had malignant skin neoplasms. Figures show that 60 per cent of women are affected by melanomas, and the average age of those diagnosed is 55. So take full care when exposed to the sun for too long, especially during the early afternoon, and maybe reconsider those sessions on the sunbed. Good skincare over cosmetic tanning is the best precaution for those with skin susceptible to moles and burning, and be sure to have regular check-ups. Produced with news.CMS in 0,0797 seconds.